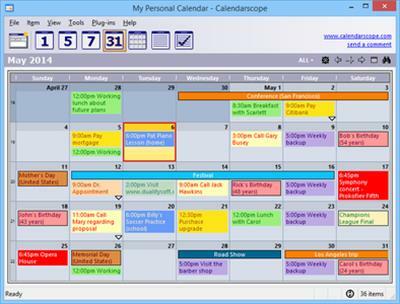 Calendarscope is a full-featured calendar program for planning, managing, and scheduling appointments, meetings, birthdays, vacations, important dates, special events, and tasks. It allows you to view all your events in standard calendar views and supports to-do lists. Reminder windows have customizable colors, fonts, and sounds, and may contain live web URLs and email addresses. Using Calendarscope, you can create single or recurring events and tasks, color-coded item types, set reminders for upcoming events and tasks, and much more.